World TB Day has been annually commemorated every 24th of March to increase society awareness about TB problem which still become global major epidemic, including Indonesia. The topic of world TB day on this year is, “Care for TB, Healthy Indonesia” aimed to increase awareness and role of all related stakeholders, and societies in supporting TB elimination in Indonesia, and make TB as a substantial issue in all development sector. 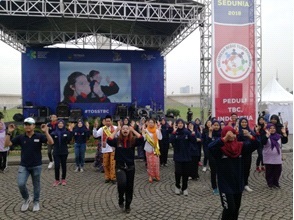 Indonesia, as one of the biggest country with the highest TB rate in the world, has also commemorated World TB Day on 24th of March 2018, at Monas field, attended by various organizations, government representative, and from several private companies. PT. Otsuka Indonesia which is engaged in health business also supported the TB campaign. In this opportunity, PT. Otsuka Indonesia collaborated with Yayasan Indonesia IMTC (Initiative on MDR TB Care) participated in a booth, sharing information about activities that had been implemented recently, spreading information and education about TB in societies. PT. Otsuka Indonesia since 2013, has many TB CSR activities, such as provides supplementary feeding for TB patients in several places i.e. in Depok, Bandung, Jakarta, Surabaya and Malang. In this event, the participants put their signature on the cardboard as their support for fighting and eliminating TB disease.